She continues to be a delight (almost all of the time). 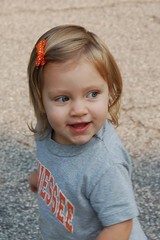 Even her cute shirt and hairbow though were not enough to pull our Vols through. However, if we ask her to say "Go Vols" she pumps her little fist in the air and says something like "Bo Balls" - every time it's one of the cutest things ever. Other things she's been saying/doing recently: Whenever she hears a sneeze or cough, she says an adorable (and very clear) "Bless You" with a huge grin. Also, she's been leaning in to us very conspiratorally and whispering "moobie", or "cookie", or whatever else she's wanting at the time - as if she's saying - "just between me and you, isn't this a really good idea". She starts Mother's Morning Out on Tuesday and we go to a bible study at church on Thursday (so she's in nursery for that) - these new transitions will hopefully go very smoothly. We'll post first day of school pictures and updates soon. A few new pictures here. Okay, that is one of the most precious pictures I've seen in a long time. She is beautiful, Brooke! We're excited with you to find out what this baby is- it's so worth the wait for the FUN surprise. And I'll pray this week that God will bring him or her in good time. Pitocin is truly not fun and it's very unlikely you'll have to go that route. Whatever the path, you'll have a beautiful baby soon! Oh, and I love your cool shadow belly pictures.